The expression may be “you catch more flies with honey than vinegar,” but for manuka honey producer Wedderspoon, vinegar isn’t too bad either. The brand announced today the launch of three new lines of products — shots, apple cider vinegar and skin care — all based around the key ingredient of manuka honey. 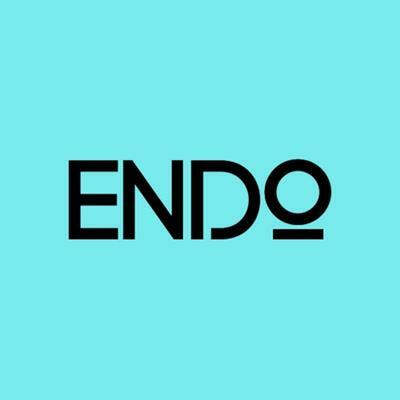 In addition, to support the category extensions, the brand has revealed a new look across its entire portfolio. Wedderspoons brand revamp and new lines come at time of increased interest in manuka honey, which is exclusively produced by bees feeding off the manuka bush in New Zealand. In 2016, Google found that manuka honey was the fourth most-searched functional food beating out cauliflower rice, kefir and bone broth. Advocates of the honey claim it has antibacterial and anti-inflammatory properties, and some scientific studies back them up. Retailers have been quick to respond — even drugstore CVS now sells private label manuka honey infused bandages. Now sold in over 15,000 retailers, Wedderspoon has benefited from this rising interest. By the end of 2017, according to CEO Rebecca Remley, the brand accounted for 73 percent of the combined growth of the manuka category in conventional, natural and specialty grocery stores. Retailers including Whole Foods Market, Wegmans, Publix, Sprouts and CVS all stock Wedderspoon products, which previously were limited to a variety of honeys as well as honey pops and drops. Remley said the company wants to continue to build off of this momentum as well as pick up new customers who aren’t as familiar with how to use manuka honey — the hope is to offer manuka honey product for more use cases. She and the executive team, felt the company’s leadership position gives them “license to be innovative” and take manuka honey into entirely new categories for the ingredient. The Manuka Honey Plus shots will retail for $21.99 for a five pack of foil packets. Each shot contains probiotic benefits and has inulin for fiber. The Honey Plus lineup includes Immunity, which contains immunity boosting ingredients such as acerola and vitamin C, Vitality, which contains adaptogenics such as maca root, and Clarity, which contains green coffee for energy and choline to assist with memory. Each shot comes in two flavors. Retailers, Remley said, are planning to stock the shots in a variety of locations within the store including the honey set, supplement set, bar set and new “superfood” sets. Many consumers already turn to straight manuka honey for immunity or energy benefits, Remley said, and the additional ingredients only enhance the ingredient’s inherent properties. 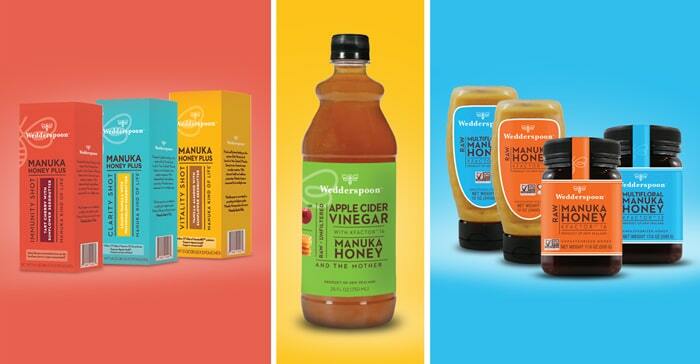 Wedderspoon will also launch an apple cider vinegar concentrate that is sweetened with manuka honey. It will retail for $11.99 for 25 fluid ounces and can be added to water to drink or used in recipes, such as on salads or smoothies. The impetus to create the vinegar was grounded in how consumers were already using Wedderspoon honey, Remley said. Additionally, the company’s research found other consumers who wanted to take daily apple cider vinegar shots, but couldn’t stomach the taste of straight vinegar. Also in response to consumers, Wedderspoon is launching a squeeze bottle format that is easier to use then the industry’s standard packaging in jars. To further showcase the versatility of manuka honey, Wedderspoon will also launch a line of skincare products that are infused with manuka honey, organic oils, and plant extracts. The new SKUs include: facial cleanser, hydrating day cream, body lotion, shea body butter, shea sugar scrub and shea hand cream. Products in the line will retail for for $20 to $25. 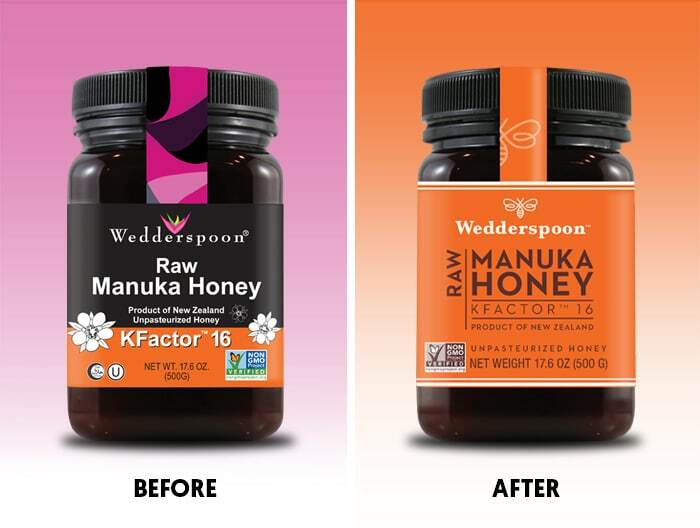 Manuka is not a cheap ingredient or product — a 16 ounce jar of Wedderspoons KFactor 16 manuka honey retails for $45.99 on its website, almost $3 an ounce. But despite the price tag, Remley says manuka has gained interest because it is multifunctional and has more health benefits then pasteurized honey. “There are certainly some things that are absolute priced but more often than not, consumers look for value for the price,” Remley said. In an effort to more strongly convey the benefits and value of its products, Wedderspoon is introducing a new packaging design for both the new products and its existing lines. The older Wedderspoon packaging was black with small pops of orange and blue. It focused more on the functional benefits of the product and some may even have seen it as medicinal. Most importantly, it wasn’t unified across all product types — each type of honey had a different look and feel. The new packaging features bright colors with black accents in a reverse of the older color scheme. It has a modern, stylized logo of a bee and speaks to the consumer in a conversational tone.